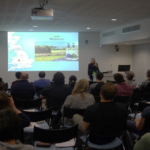 Last year I went on a rheology tour!! 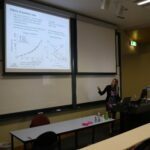 I gave 12 talks in 10 days in 7 locations around Australia and New Zealand, talking primarily about suspension rheology and how particle characteristics such as particle size and shape affect rheology. 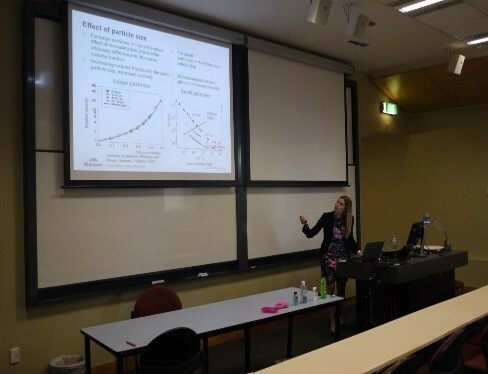 I spoke about the stability of suspensions and the factor to consider when assessing suspension stability but another major focus was the viscoelastic properties of materials. Viscoelasticity: A material that possesses both liquid and solid-like properties which may change depending on how we handle and treat it. One great example of a viscoelastic material is pitch, asphalt or bitumen – that black sticky stuff we put on our roads. 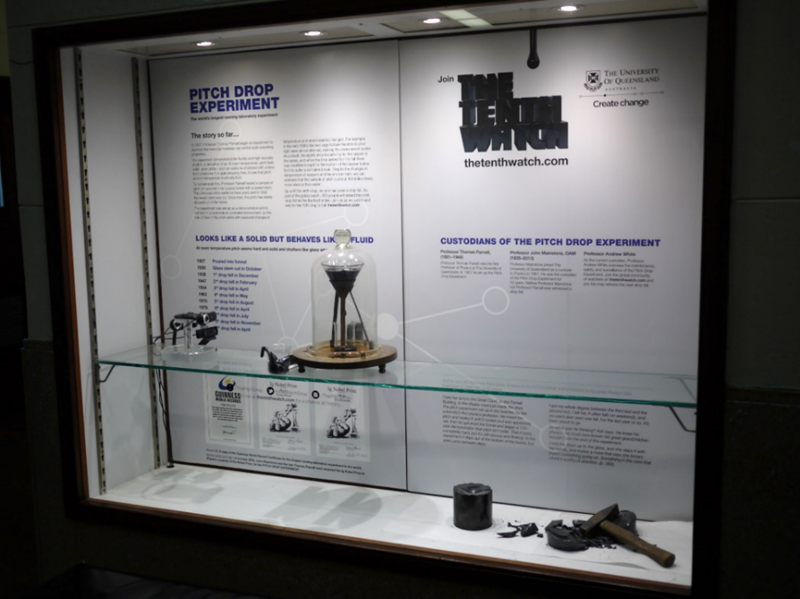 It also features in the Guinness World Records, as the focus of the longest-running laboratory experiment, which was started in 1927 by Prof. Parnell at the University of Queensland, Australia and is still running (you can see where this blog is going!). 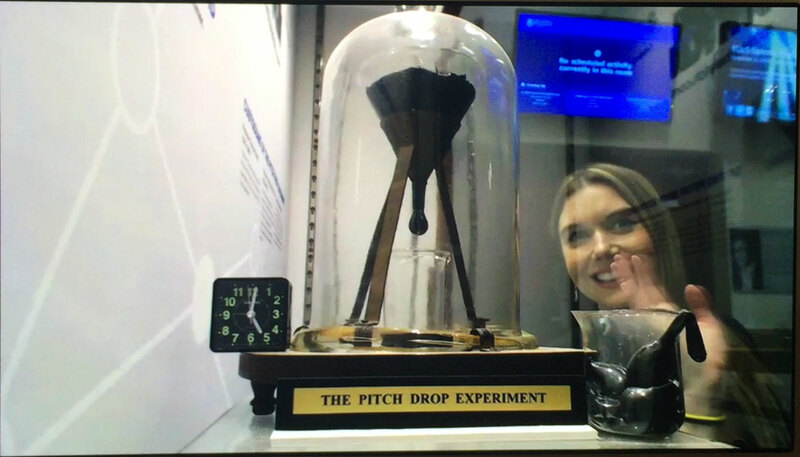 Over the last few years, when I teach rheology I always mention the pitch drop experiment, we even found out that you can view this experiment live via a web cam! Considering it takes around 10 years for the pitch to drop from the funnel, this contrasts starkly with watching Usain Bolt run the 100 m! And it definitely puts ‘watching paint dry’ into perspective! This experiment is a perfect demonstration of a material behaving differently depending on the deformation conditions. If left in the funnel this material flows over time and drops from the funnel into the beaker below (behaves like a liquid). However, if hit with a hammer, this material shatters (behaves like a solid). 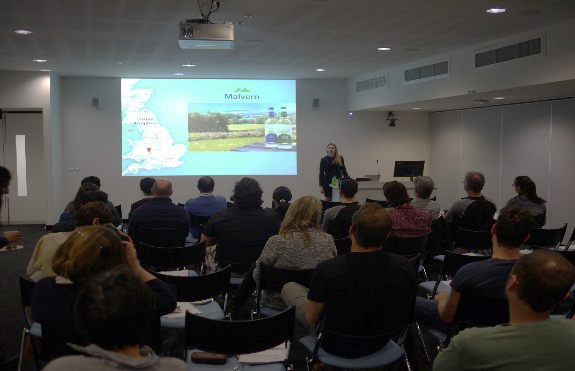 Towards the end of my tour, after much anticipation, I finally arrived at the University of Queensland to give my talk. 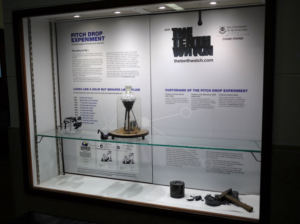 You can imagine my excitement (I received some strange looks from students at the University) when I finally got to see the pitch drop experiment after talking about it for so long! I sent the live link back to the UK and told them to stay tuned, 30 seconds later I popped up on the webcam waving! I can also safely say my rheology colleagues were equally as excited! Hopefully in 10 years time if they play back the live feed as a time-lapse video to show the drop progressing, I will have my tiny feature/claim to fame. Made it into the Guinness Records! If you want to know a bit more about viscoelasticity then why not watch our introductory webinar on viscoelastic measurements or view our introductory white paper on rheology.